Does it REALLY take 7 days to drive the ~3000 km from Adelaide to Darwin? Only if you want to see a few sights along the way on a REAL adventure! Driving yourself is the best option (try Car hire if your vehicle isn’t up to scratch) to experience a cross-section of Australia’s unique countryside from the dry south, through the Red Centre deserts to the lush tropical north! AND come to terms with the vast distances that road-tripping in Australia demands! So follow my rough guide from Adelaide to Darwin via Uluru – with LOADS of optional extras! BUT … be warned! It might just mean your epic trek takes a few extra days!! Scenery: Varied. After leaving Adelaide, drive through the scenic Clare Valley wine region; then along the edge of the Flinders Ranges to Pt Augusta. At this point, you’re still on the Adelaide Geosyncline (yes, I’m showing off! )(Dad, are you reading this??) landform. It’s all Outback from Pt Augusta, and the drive along the Stuart Shelf, an extension of the Adelaide Geosyncline, is unremarkable but for some unexpectedly spectacular land formations. Enter the Woomera Prohibited Area (well … it gave ME a thrill!) 7 km off the highway from Pimba. The outdoor missile park’s unusual collection of relics from rocket range days is all the more bizarre for its location. The Heritage Centre’s excellent displays show the fascinating heritage of this little town on the edge of nowhere that has variously included the Rocket Range, NASA Deep Space Tracking Station and a controversial Asylum Seeker detention centre. Scenery: Central Tablelands, with mesas, low hills and salt lakes before reaching the Stuart Range near Coober Pedy, where the landscape is dominated by mullock heaps. Lake Hart – either a saltpan so white it’ll hurt your eyes; or an oasis in the outback full of water! Coober Pedy Mullock Heaps; Underground buildings and accommodation; and opal! While passing Glendambo, spare a thought for Pilchard & I as we inched towards Glendambo after car trouble struck heading south just over half way from Coober Pedy in 2004. The most compelling argument I can think of for a) carrying water and b) having paid up Road Assistance membership, with a blown head-gasket, the car was, as the mechanic put it in technical terms, ‘stuffed’. Although he used a different word. Road Assist paid for a) a motel unit; b) bus fares to Adelaide; c) trucking the car to Adelaide for repair; and d) general expenses. I still shudder to think how much we’d have been out of pocket – so DON’T leave home without it! Staying in Coober Pedy’s underground accommodation isn’t for the claustrophobic – but IS something to experience at least once! It’s even got the world’s only underground campground (or so I’ve been told). And looking for Opal, either in the tourist ‘noodling’ area OR ‘finding’ it at the nearest opal showroom can be very rewarding!! Options: Stay another night and tour the nearby Breakaways and Painted Desert; the underground churches; and a working opal mine. Then take a round of golf at the Coober Pedy Golf Course. It DOES offer reciprocal rights to world famous St Andrews in Scotland after all!! Scenery: Varied. Once past the mullock heaps, red sandy soil and vegetation cover low hills, then the Indulkana range past Marla. Across the border, granite outcrops before entering the Amadeus basin, a former seabed. The Dog Fence – longest man-made structure in the world! Start early for a long day because – trust me on this – you DON’T want to drive at night! There’ll be enough opportunities to hit stray wildlife during the day, when at least you can (mostly) see it coming! Do I really have to tell you what THIS is? Turn off to Uluru at the Erldunda Roadhouse. Mt Connor, at Curtin Springs station, is often mistaken for Uluru and is a tourist attraction in its own right. But there’s no mistaking the vast bulk of the world’s biggest monolith as it glows in the setting sun. Stay an extra night to explore Uluru and Kata Tjuta more thoroughly. Alternatively, take a detour to the remarkable Kings Canyon, and relive one of the more memorable scenes from cult Australian movie ‘Priscilla, Queen of the Desert’! Scenery: Central Desert and ranges. Spend the morning exploring the amazing Uluru and Kata Tjuta formations before returning to Erldunda and heading north to the Stuarts Well Roadhouse for a bizarre, uniquely Australian experience! Doesn’t EVERYONE want to see a singing, piano playing Dingo? STOP PRESS: Tragically, Dinky has now retired. But this means extra time to take the short detour to Rainbow Valley, right?! Check road conditions at the Stuarts Well Roadhouse – the turnoff is 14 km north; then it’s another 23 km along a dirt road to Rainbow Valley. Stay overnight at the Rainbow Valley campground! Factor in extra time to explore Alice Springs – it’ll take a LOT more than an overnight stay to see the sights! Scenery: Spectacular ranges around Alice Springs, which flatten out into the grassy plains and rocky outcrops of the Barkly Tablelands. Wycliffe Well Roadhouse’s unusual murals, strange otherworldly figurines and Elvis campsite are worth a look. Just up the road past the Wauchope Hotel are the Devils Marbles. While they’re at their best at sunrise or sunset, they’re worth stopping for any time! Then it’s another hour or so up the road to gold mining town Tennant Creek. Stay overnight at Wycliffe Well, Wauchope or the Devils Marbles campground for sunset/sunrise shots of the Devils Marbles. Tennant Creek is 106 km north. Scenery: Barkly Tablelands grasslands and cattle station country continue to Newcastle Waters. Tropical vegetation hides many relics from World War II, before the lush tropics of Mataranka and its thermal pools. Mataranka and Bitter Springs Thermal Pools – once part of Elsey Station, where the events of Mrs Aeneas Gunn’s classic Australian memoir ‘We of the Never Never’ took place. Busy Katherine, on the edge of Nitmiluk National Park (also known as Katherine Gorge), is a crossroads and stocking-up point for travellers heading west to Kununurra or east to the Gulf of Carpentaria. The thermal pools just out of town are a popular gathering point at the end of a long day on the road. Options: Stay 100 km south of Katherine at Bitter Springs, and soak in its famous thermal pools. Who could resist seeing the world’s biggest man-made termite mound in Mataranka’s main street? It even TALKS! Take a morning tour to Katherine Gorge or nearby Cutta Cutta Caves before completing the drive to Darwin. Although there’s lots to tempt the inquisitive along the way! Stay an extra day to explore the Katherine Region more thoroughly, including the Gorge, and the marvellous Edith Falls just north of Katherine, for swimming and bushwalking. Take the scenic route through Kakadu National Park to, with its distinctive landmarks, walks, tours and scenic attractions to Jabiru, then via Mary River and Humpty Doo to Darwin. Stay an extra day in Batchelor and explore the natural wonders of Litchfield National Park! Darwin is an adventure in itself so you might want to consider an open-ended car rental arrangement. But of course it all depends on how much time you’ve got. It’d be easy to spend a further week exploring this Top End wonderland – check out my TOP 10 Things to Do in Darwin HERE! But if Darwin’s the end of the line, all you’ve got to do is fly or drive somewhere else! Like continuing your road trip – try my 7 Days from Darwin to Broome itinerary! Next Post: Red & Pilchard’s Ultimate All-Australian Travelling Cafe! Aussie ABC – D is for Dune! We are doing this trip the end of May with friends going up. Coming back middle of July by ourselves, not that good at reversing the van, so go where we can drive through. Can you give us some places where to stay on the way back where there is plenty of room to dive in, e.g free camp spots. How exciting, Kay! I hope your trip goes well!! There are quite a few caravan parks and campgrounds on this route and as I’m not sure how far you want to travel in one day, and what you’re hoping to see, I’m including a couple of links you might find useful. 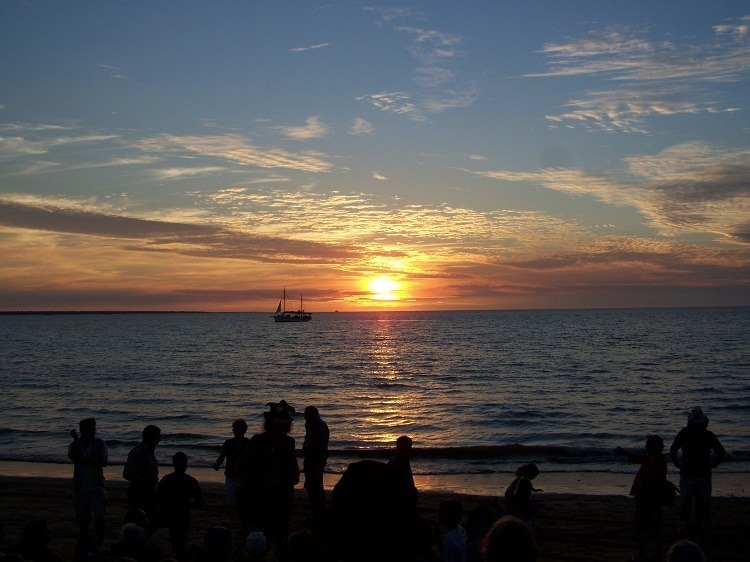 This one has a list of Caravan/Camping Grounds in different regions in the NT (http://northernterritory.com/plan-my-trip/accommodation/caravan-and-camping-grounds). This one is the official NT Caravan Park Guide by region (http://www.ntcaravanpark.com.au/regions). And this one is free/low cost campsites around Australia (http://www.freecampingaustralia.com.au/). There are also a number of camping apps that might be useful like this one from Explore Australia (http://www.exploreaustralia.net.au/Bookshop/Guides/Apps/Camping-around-Australia-app) or this one from Camps Australia (http://www.campsaustraliawide.com/shop/camps-app/). There’s also the most popular app – Wikicamps (https://itunes.apple.com/au/app/wikicamps-australia/id505365608?mt=8&ign-mpt=uo%3D4). You’ll find that most roadhouses and small settlements have a campground. Many of these have drive through sites but if that is essential, it is best to check and perhaps book one beforehand. For the record, I’m listing the places we’ve stayed at that had drive-through sites when we have travelled this route at different times: Woomera Caravan Park (SA); Oasis Tourist Park Coober Pedy (SA); Cadney Park Roadhouse (SA); Marla Roadhouse (SA – not all sites are drive through); Stuarts Well Roadhouse (NT); Wycliffe Well (NT); Renner Springs (NT – haven’t stayed here yet, but pretty sure it’s got drive-thru); Dunmarra Roadhouse (NT); Bitter Springs Cabins & Camping (NT). But there are a LOT more we haven’t stayed at – so check what you want to see; then check out what’s in the area and take it from there! Good luck!! This looks like a awesome trip Red! Me and my partner is actually considering driving down from Darwin to Adelaide or we don’t mind do it the other way around. It would be great if you can give us some tips from your great experience! Some of our friends who’ve done road trips through Australia suggest that we may want to rent a 4WD car for our trip, however others reckon 2WD will be good enough. May I ask what car did you use for your trip? Also, we are a bit considered about the accommodation through the way. As we are really trying to control the budget, we are planning to stay in our rented SUV in caravan park and motels, half half, cause according to my research, staying in hotels through the way is quite dear. What’s your opinion on this? We are planning to finish this trip in 7-8 days just like what you did, would that be enough time or actually a bit too tight? Sorry about all these questions and thanks for sharing your experience with us, it is absolutely helpful! Hi Samantha! This is one of Australia’s great road trips – but make sure you leave enough time. It CAN be done in the times I suggest, but you’ll spend an awful lot of time on the road with very few breaks. I would suggest taking a couple of weeks if you can because you might want to spend more time at some places, like Uluru and Alice Springs, for example. And the pace of driving a few hundred km every day can be exhausting. The roads are sealed all the way so unless you’re planning a detour onto the dirt or somewhere you’ll need high clearance (like off road river crossings), you shouldn’t need a 4WD – perhaps check road conditions online or with the RAA/vehicle hire company before you hire the car just in case something’s changed. We did the trip in Subaru Forester AWD but we didn’t engage the 4WD at all during the trip. Yes, it CAN be expensive staying in motels/cabins – one alternative is to take a tent or even swags (borrow from friends?) and spend some of the nights camping. There are free camps at various places along the way. Some roadhouses also have budget on site accommodation – usually a smaller room with more basic facilities (sometimes bunk beds) and shared bathroom, but you won’t be spending much time in the room, right?! For example, Cadney Homestead (northern SA) has motel rooms from $110 minimum, but budget cabins starting from $52 according to the website I looked at – not all budget accommodation is this inexpensive, but take it where you can. Another eg is Stuarts Well near Alice Springs – a cabin is from $105 pn; a budget twin or bunk room is from $30 pp pn. You’ll also see a BIG difference in site fees and cabin costs at caravan parks – if you can swag or tent, you’ll save a LOT. You don’t have to stay in the places I suggest – sometimes it’ll be cheaper to stay outside the major towns so familiarise yourself with the route, and shop around before you go to get the best prices. I hope this helps! Good luck, and ENJOY! This looks like a great trip. My husband and I are thinking of doing this trip in a few weeks’ time. We have a new Kia Sportage and will be seeking accommodation along the way. We’re not campers but like staying in cabins or motels. Are there these types of accommodation available at the places you stopped? Also, is there any ‘above ground’ accommodation at Coober Pedy? Hi Shirl! I hope you have an awesome trip!! You shouldn’t have trouble finding cabin/motel accommodation in most of the places I’ve stayed at, but I would recommend booking, or at least checking ahead first because it’ll still be the tourist season and pretty busy. You might find tour groups have booked out a whole motel, for example, so it’s wise to at least check in advance – I recommend googling the place you want to stay for the most up to date information. There IS above ground accommodation in Coober Pedy – I’ve stayed in a cabin at one of the caravan parks. Enjoy your trip! We are planning our trip North for Sept/Oct and can’t wait. Still trying to convince the teenaged family members that it’s going to be mind blowing. We only have 3 weeks (work and school commitments) so plan 7 days Adelaide to Darwin, a week in Darwin and surrounds (we have family there to visit) then a week to return hopefully via Birdsville (we are still planning this leg of the trip). I have bookmarked your site as a great reference – thanks for sharing your advice and experiences. I’m so jealous, Tracy! This is an AWESOME road trip – hope the teens find it cool too. Maybe just tell them they’ll have FABULOUS photos & stories to share on Facebook?? I’ve never quite made it to Birdsville – Bedourie is closest we got – so I hope you get there too 😀 It’s my pleasure to share my experiences (although I have no teens!!) and I’m glad it’s been useful! This seems like an amazing trip. I hope to do this trip, except my family would be driving from Canberra. Based on your itinerary. within my family we’d probably drive upto 12hrs a day between 4 adults, I’m thinking this would take a minimum of 2 weeks not including seeing the main sights. So I’m thinking a total of 3 weeks to spend? Where did you get your travel information from? It seems on point. Good luck with your future road trips, they sounds amazing. Hi Asha! While it’s possible to drive for 12 hours a day, especially with 4 drivers, please be aware that driving outback roads at dusk, sunset at night is VERY dangerous – you DON’T want to hit a kangaroo – or anything else for that matter!! So please factor that in to your planning. I’m sure you’d enjoy the trip more if you factor in the extra time you suggest – more if you can – that way you’ll have time to enjoy the sights as well as take one of Australia’s best road trips. Are you planning to return the same way? If so, you could skip some of the attractions on the way up, then plan to visit those ones on the way back. My husband, daughter and myself did almost the same trip (from Melbourne to Darwin)years ago in a campervan. We took two weeks. It was a blast! Thanks for bringing back some great memories. It seems like quite a few town names are first names–Katherine, Darwin, etc. That would certainly make the trip interesting, at least for me! Zane was very interested in the Road Train, by the way. He loves all kinds of trains. I would love to do this trip but it won’t be this year. That’s a long trip….we are still trying to mentally prepare ourselves for Adelaide to Alice Springs (unfortunately no dates yet to actually do it due to that pesky thing called work). Between CP and Uluru, is there anywhere else to break the trip? Or just make the commitment to spend 8 hours in the car and go for it? @Go Camping – We have stayed at Cadney Homestead and Marla (on different trips) – both are roadhouse complexes with caravan/ camping/ accomodation/ meals. Across the border is Kulgera Roadhouse – haven’t stayed there, but looked fine last time we drove through (2012). Can also stay at Erldunda (at the Uluru turnoff), or Curtin Springs Station (approx 70 km from Uluru). Just depends where u want 2 spend most time! Thanks Red – its good to hear from others who have done the trip. I was just thinking that 8 hrs could be too much for a restless daughter in the backseat, so we should try to break the trip into more manageable bites. What a great place to visit, I would love to take this road trip. Thanks for sharing the info and the photos are great. Maybe someday, Australia is on my bucketlist! @Rohrerbot – It should be no surprise to you to find that this whole trip is full of amazing birds!! Because it’s such a long way, the habitats are very diverse – start saving NOW! @Jim – I’ve got Pilchard to thank for several of them! @Mary – You haven’t seen the half of it!! I struggled to limit the number of pix (the post was already a bit long) so actually yes – I DID leave a few things out, and there WERE a couple of things we’ve left for next time!! Always leave a place wanting more, I’ve found! @George – That’s one of the great things about doing OZ bottom to top – the scenery along the way changes dramatically and that’s almost as much fun as the sightseeing & detours! @Iris – So glad my post gave you happy memories! There are so many great places along this drive, but you’re the 2nd person who’s mentioned Oodnadatta, and that is still a place we haven’t seen!! Happy saving!!! @Mrs Tuna – HAhaha, and the UK + Arizona would nicely fit into one of Australia’s smaller states … that’s why it’s so diverse, because there’s a complete & utter climate change between top & bottom!! @Ramakant Pradan – I do hope you get to see it for yourself! And just between us – it’s EASY to take good photos in Australia because the scenery is so AWESOME! @ladyfi – It’s ALL just one big adventure downunder!! @diane b – Long haul driving isn’t for everyone … but it IS an adventure, especially the first time!! I’m with you on the faves … and thanx for your kind words! @PDP – Haha, thank you! Feel free to share that thought with the OZ Tourism Board whenever you’re ready … the only thing keeping me in the underground room was that it was a B&B in the side of the hill – more like a hobbit house! So even though no windows, the door was always visible!!! Nice itinerary. Will try it out when I get to visit Australia sometime. You do have some fabulous photos there. Awww, the Mindil Beaches. Now I´m hungry! For great food, the warmth and the beauty of the place! Yes, Womera was quite a bummer. To imagine the first guys lived in simplest huts, phew! The painted desert truly is beautiful. As (kinda) is the moon desert. Thanks to the people from the Pink Roadhouse in Oodnadatta we found all of that for a change. Road Trains really are amazing. If I wasn´t that shy I maybe might´ve seen one from the inside back then. Priscilla, oh, yes 🙂 And, btw, Alice has – I think – the best Jerky in the world! We visited the factory and bought heaps! Awwww, Mataranka! We stayed way over a week! Never, never go without H2O! Still will have to come back one day! What a marvelous adventure. The variety of landscapes you encountered is amazing, and each had its own special beauty. I look forward to seeing your next adventure. Pretty freaking diverse little country you got there. I pointed out to the Brit that all of the UK was the same size as Arizona, such a tiny teeny country. This is a great guide for driving up through the Red Centre, Red. We are coming over to SAust via Uluru in Sept, but we are taking the long route along the Oonadatta Track – hope there will be lots of water in THE lake! The top half will have to wait for another trip – I will need to bookmark this post for later! I totally agree with Grace, there is no other site that presents Australia in all her glory like you do Red. And that’s fair dinkum. I also appreciate the work that goes into these posts. I spent ages reading through this post and ogling the pics. Talk about armchair travel at its very best! I honestly don’t know of any other venue that shows off the Australian outback in all its splendour like you do Red. Each post is a gem, although…..there’s noooooo way in hell that you’d get me to stayin an underground hotel room, I get breathless just thinking about it. That is some drive! I doubt we would enjoy driving those long stretches. However, somehow we have managed to see many of the places you have mentioned by using aeroplanes and 4 wheel drive tours. It is amazing how many wonderful places there are to see on such a trip. You are good at travel blogging. I loved King’s Canyon, Uluru, Kata Tjuta, Katherine Gorge and Litchfield NP best. Adelaide to Darwin is a trip I’d love to make one day, but I’d probably go by bus or train, so I’d miss the extra stops and sights. but I’ve seen plenty here to satisfy me for now. Wow — what an adventure! So much to see – so beautiful! May be I will plan some day. Great info. About a year ago I did Uluru to Cairns in 10 days and that was pretty manic. @Dina – It IS a fantastic adventure! Don’t let the distances, fuel availability, road trains or remoteness put you off in the slightest!! @Indrani – So much space, so few people – what’s NOT to love? @LONDONLULU – I’m sure I’d experience severe culture shock if I visited you! Although many parts of the East Coast are very built up too … but we’ve never had any trouble finding the out-of-the-way spots even there! @Friko – I’m planning a few more virtual road trips this year (along with a couple of actual ones) so stick around!! The more the merrier! @Andrew – Go on! Be flippant!! That’s what I like about you!!! @MJWC – Haha, I tried to upload a video of the dingo, but it didn’t work … I’ll keep trying! amazing territory you covered; I especially like Katherine Gorge and Litchfield. Wow, and those road-trains – you must’ve wondered how far back you had to walk to fit it in! Would you be my guide? What a fascinating continent Oz is. There’s no place on earth that comes anywhere near. It sounds like a fantastic adventure. Such a Bizarre fantasy land you live in. I’m pretty sure if I drove 3,000 miles I would wind up in California and lots of amazing photos as well. Of course you are talking kilometers so I might only make it to Vegas. Either way, I want to be just like you so I’m saving for gas (or is it petrol) money starting right now. Okay, you’ve talked me into it. What time will you be picking me up? I love doing that… getting in the car, driving and stopping at sites along the way. Loads of fun. You went some pretty cool places. I would love to see the Dino play the piano… looks like he is singing too! For once I won’t be flippant and I suggest this is quite a good road guide for the trip.